Even if you have been reading this blog as long as it has been around, since way back in 2008, you will know that I loved Pediped then with my oldest. I continue to love them now with the youngest! Pediped recently agreed to send me a pair of shoes from their new spring line. I keeping my fingers crossed that I would receive the Joshua or some similar style and luckily I did! I just love the cute little fisherman style shoes on boys during the spring! It matches perfectly for Easter outfits and just works for everything during the summer months! These shoes appear to be so comfortable for my little man. The Memory Foam is very "squishy" for him, and he loves to wear these shoes around the house, even when he does not need shoes. I think he just loves the way they feel! My little man has a very large foot and generally wears a 7.5W, so we asked for an 8. The 8-8.5 are just a tiny bit too big, which is what I expected. So they are definitely true to size. I LOVE that Pediped provides shoes that both of my boys can wear even though they traditionally need a wide size. While Pediped does not offer wide shoes, the way the shoes are made, they fit a wider foot! 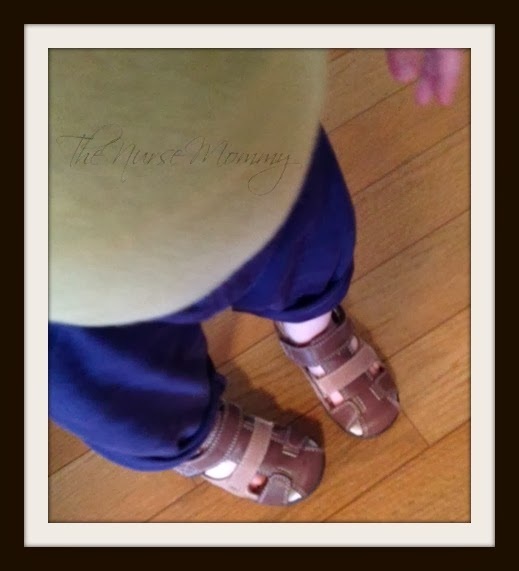 I also love that I know that these shoes promote healthy foot development when my boys wear them! Since I love adorable shoes on my boys so much, it is important that what they are wearing not only looks adorable but are good for their growing feet too! My oldest son actually went through a phase that he was obsessed with the Jake shoe from Pediped. This is when he was about 3-4. I actually had to purchase two pairs because he wore the first out so much, and refused to wear another shoe!! I just love all of the styles at Pediped, and I am not even going to get into the girls shoes! It will just make me long for a baby girl even more, because the shoes are simply adorable! Win It: One lucky winner will receive a pair of Pediped Original shoes which come in 0-6, 6-12, 12-18 or 18-24 months. Winner may pick boy or girl style but not the shoe itself. I love the Louisa originals in the seashore print! I like the Originals Jordyn in white. I like the Jordyn in white & the Adrian in brown. I like the Inez Lavender shoes. I like the girls flex venus in purple. I love the Bree seashore style! I love the Flex Luna - Sangria Pink. I like the Originals Naomi - Black shoes. Thanks. i like the adrian shoes... thanks! i like the Grip and Go BRICE expresso. i adore "Louisa" in seashore! The Alexis flat is cute!